Whether for a long-awaited upgrade an existing property or a new home, Star Painters LLC offers high-quality painting services that increase the value of one of your biggest investments. Interested in a remodel, addition, upgrade, whole-home build, or commercial construction? Our interior painting is focused on added value. Ensure that your investment leads to better functionality or higher returns if it’s time to sell. Our interior painting services aren’t performed by subcontractors, but detail-oriented, highly experienced interior painters in Keizer who are dedicated to their craft and the overarching mission of our company. Our main priority is making sure we’re always on the same page with our clients. We ensure you have a clear understanding of what’s happening throughout the project. At Star Painting, we do more than just painting. We consider details that range from removing fixtures to paint beneath them, repairing wall damage, cleaning surfaces, and applying primer, multiple color coats, and a topcoat. And for each project, we determine which type of paint is most suitable and make sure you know exactly what you’re getting before any rollers touch the wall. Keizer homeowners choose Star Painting because they know they can count on competent, highly professional painters to handle their project. Not only do we guarantee a high-quality finish, we guarantee a high-quality experience. From doorknobs and trim to crown molding and frames, our team never overlooks the details. We’ve been in the business long enough to know what the ‘rookie mistakes’ are. It’s simply not in our nature to skip preparation efforts, leave messes at the end of the day, or forget to communicate crucial information. Our team also understands how frustrating it can be to learn that a project missed its deadline. That’s why we take steps to ensure that even if there are setbacks, we communicate them and find ways to make up lost time. Even if that means working evening hours. Speak directly with our painters and consultants to get help choosing the right forumlas, textures, and colors for your interior painting project. We’re staffed and equipped to handle small and large projects ranging from cabinet staining to multi-unit facility upgrades. And we keep it convenient for you by offering paint swatches and inspiration photos in our Keizer showroom, The Tile Gallery. 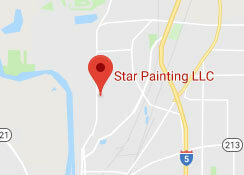 Star Painting offers a no-obligation consultation for Keizer home and business owners. Feeling pressured to choose the first painting company you find shouldn’t be the reason behind such a big decision. That’s why we allow you the time to decide whether we’re the right fit for you. It’s all part of our commitment to excellence and upholding our award-winning reputation. Talk to our dedicated team today. We offer more than your average house painter with interior and exterior painting options, a complete showroom, a full-time staff, and dozens of awards to our credit. For better indoor upgrades, choose Star Painting.